When I decided to grow vegetables in my garden, I knew I didn’t want to rely on commercial fertilizers. Instead, I planned to do composting with leftovers, leaves, and other rubbish. Not only would this save me money, but it’s also better for the environment. Now I’m pleased to stop sending as much garbage to the landfill, and I’m glad I’m not adding non-organic chemicals to the ground. A while back, I began shopping for the best compost tumbler to place in my yard. I found three composters that had qualities I liked. I’ll begin this review by telling you now about the best tumbling composter that I chose for my home. The Yimby Tumbler Composter holds up to 37 gallons of compost. That translates to 5 cubic feet total. It has two composting chambers, so I always have fertilizer ready when I need it. And it’s a lot more convenient than managing a pile of compost in the yard. One of the features I appreciate about the Yimby is that it stands a couple of feet off the ground on a steel frame. That fact makes it easier to reach without a lot of bending. Then, its openings are large enough for me to use yard waste bags or leaf scoops to pour in grass clippings, mulch, egg shells, and coffee grounds. There are also many perforations that allow air to circulate. The manufacturer recommends rotating the tumbler 5 to 6 times every couple of days. They say the composter can produce fertilizer in as little as two weeks if you place it in hot sunshine. While there are no handles, there are plenty of places to grip the barrel for turning. And the fins inside the barrel help break up clumps as you spin it. One of the concerns I had about purchasing this type of composting tumbler was BPA in the plastic. But the Yimby is made of recycled polypropylene that is BPA-free and doesn’t degrade in sunlight. The only downside to this composting tumbler is the fact that it needs to be assembled when it arrives. You’ll want to plan on taking 30 minutes to an hour to finish the process. 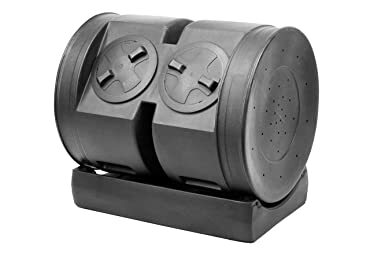 While I chose the Yimby compost tumbler for my garden, you might find that one of the next two models suits your needs better. The Good Ideas Senior Wizard compost bin offers more than double the capacity of the Yimby. It has two chambers with 5.5 cubic feet per side. And one of its highlights is that it arrives fully assembled. 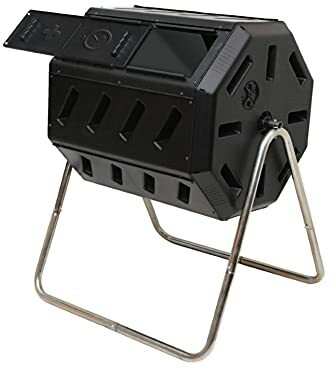 The manufacturer states that their product is made in the United States with “FDA – approved materials.” Since I was unable to discover exactly what those materials are, I decided against buying this composter although it has an appealing design. On the bright side, the tumbler openings are sealed with lids you need to turn to open. This fact is an advantage if you need to protect your compost from animals or curious small children. Good Ideas offers a one-year limited warranty. My final selection is available in two sizes. The one I chose to review is the larger of the two. Envirocycle optimistically calls their tumbler bin “the most beautiful composter in the world.” It has a sleek design that would fit into almost any yard. You can also select from either black or hot pink. The only downside is that the tumbler consists of only one chamber, not two. But that chamber can hold up to 35 gallons. One of the best features of this composter is the fact that it built from BPA – free food safe plastic. This material, which happens to be recycled and purified HDPE, is resistant to ultraviolet light. As a result, the tumbler should last for years of service. Similar to the model from Good Ideas, you won’t need to do any assembly when the tumbler arrives. And the Envirocycle has a clear advantage over the prior two composting bins. It is designed to create both solid compost and compost tea, or liquid fertilizer. The tea drips down into the base of the drum, where you can harvest it from time to time. Conversely, you can let the liquid drain into the ground instead. Now that you see the three best composting bins, I’ll give you insight into why I chose each one. You may have guessed already that one of my primary concerns was whether the plastic of the compost tumbler would be free of hazardous chemicals. But I also had other criteria in mind. Besides the fact that I wanted plastic that wouldn’t pass on toxins to my garden, I desired a compost bin that would be easy to use. I liked the Yimby because it has two chambers for a total of 37 gallons of compost. It’s also taller and easier for me to reach without a lot of bending. It saves my back when I need to turn it or deposit more rubbish in it. On the other hand, you may prefer the bin from Good Ideas if you have small children since its lids don’t slide, but rather turn. Or if you like to use compost tea in your garden, you might like the Envirocycle tumbler best of all. Composting is an efficient way to reduce the amount of garbage your household produces and turns it into something useful. Making your own fertilizer can save you money, too. Grass clippings and leaves from your garden are an essential part of making compost. Please take a look at my reviews of the best leaf scoops and reusable yard waste bags to help you save time and cut costs on yard work as well.